Sofa City rides again, in… Elvis Night! All Night! From the people who brought you last year’s ground breaking tv themed triumph “Why Don’t You…. 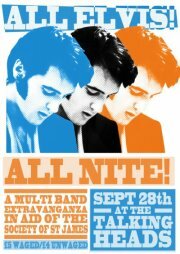 ?” Sofa City Band Collective, in association with those marvellous cheeky Spiraltones, are pleased and proud to invite you to “All Elvis, All Night” – a multi band, multimedia, multiple Elvis hipswivelling charity extravaganza in aid of The Society of St James. Unit11studios steps up to the stage design-wise. Expect all things King-related. Dust off that Vegas jumpsuit, perfect the sneer, and uh-huh and Aloha , all sorts of Elvis related fantasticness will ensue. You would be out of your tiny minds to miss this one, peeps. £5 waged £4 unwaged. BBC Introducing gets the world exclusive on the track “Compulsion” from the new Accrington Stanley album. Listen here (6 days only). More exciting news from the Stanley hotline: BBC introducing in the South are going to be playing a track from our new album this Sunday! 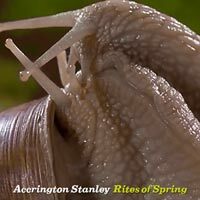 Accrington Stanley heave audibly with pride at the release of their new EP. Featuring the first single from the new album (currently at mastering stage and due for release early autumn), “Rites of Spring” is the first official release from the band since 2005’s “Uplift” and has already enjoyed airplay on Southampton’s Voice FM and a teaser video on YouTube. Hi folks and welcome back to a very flatpack version of what will become the new home of ACCRINGTON STANLEY. Apologies to all for the brief period of radio silence while we hauled our luggage aboard the new server – give us a couple of days and I’ll get a lick of paint around the new gaff. Breaking News of course – 22nd November at the Brook, supporting Dodgy!